Fourth Row Center: Film Writings by Jason Bailey: On DVD: "Virtual JFK- Vietnam if Kennedy Had Lived"
On DVD: "Virtual JFK- Vietnam if Kennedy Had Lived"
There are few things as genuinely thrilling as a truly well-made documentary. 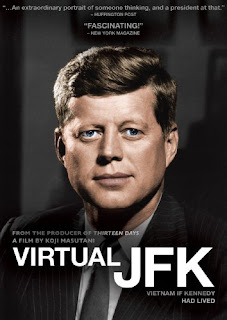 Koji Masutani’s Virtual JFK: Vietnam if Kennedy Had Lived is that, a masterfully assembled and strenuously researched “what-if” scenario in film form. Those “what if” questions have haunted Americans of all stripes, from historians to vets to grieving families, for decades; they formed the backbone of Oliver Stone’s JFK. What were Kennedy’s intentions in Vietnam? Were we on a path to withdrawal when those shots rang out in Dealey Plaza on November 22, 1963? What would have happened in Southeast Asia if Kennedy had finished out his presidency? In an attempt to craft what is called, alternately, a “virtual history” or “counterfactual history” (this is where the awkward title, which conjures images of a Camelot-era Sims, comes from), each of those six moments are examined, one by one: the Bay of Pigs, the Laos crisis, the Berlin crises, the Cuban missile crisis, and the discussions of withdrawal immediately before his assassination. Within that structure, the resulting film is a thorough and complex examination of the Kennedy presidency, of his decisions, and what we can infer from them. The film is a triumph of montage; Masutani (who also edited) uses little in the way of recreations or created illustration, and Blight himself is barely glimpsed. Most of what we see is a wealth of smartly compiled archival footage, which places JFK front and center in his own story. Excepting Blight’s occasional interpretations, the late president mostly speaks for himself, via extensive use of his speeches, private recordings of phone calls and meetings with his inner circle, and remarkable clips from his famous afternoon press conferences. That footage is particularly interesting; we see a President who is candid, funny, and quick on his feet. (Some of the questions also remarkably parallel current inter-party squabbling; the more things change, the more they stay the same.) Perhaps the most shocking piece of tape is a clip from less than four hours before his assassination, as commentators wait for Kennedy to arrive at an appearance, mentioning a slight security breach earlier in the day and casually discussing the assassination of William McKinley. The death of the president is handled tastefully and rather heartbreakingly, while the picture nimbly moves through the Johnson years, summing up the escalation of the Vietnam conflict with a simple sequence of dates, casualties, and snippets from speeches. The film’s only real flaw is that it doesn’t quite seem to pull everything together at its conclusion—it seems to fall short of a final analysis, one that really answers its titular question. If Kennedy had lived, the film argues, we would have gotten out of Vietnam. But what then? Virtual JFK: Vietnam if Kennedy Had Lived may come up a bit short in its final passages, but it is a fascinating and well-crafted documentary nonetheless, diligently researched and carefully constructed.